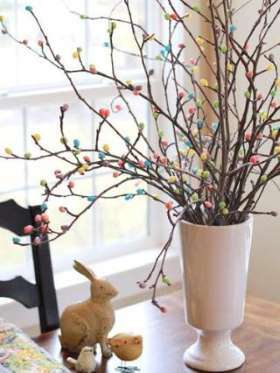 JELLY BEAN TREE ~ simply hot-glue or push on jelly beans to the ends of branches to create a jelly bean tree that's as attractive as it is delicious. 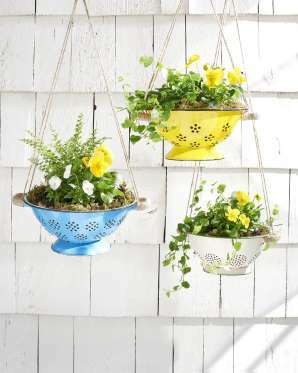 CONVERT A COLANDER INTO A PLANTER ~ forget about the flower pots, turn your favorite flowers into this easy DIY display. FELT EASTER CHICK ~ these adorable felt Easter chicks can be molded into any position you like (these ones are dancing!). 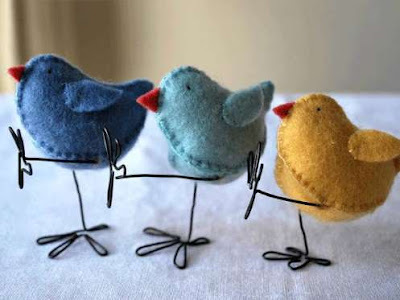 For a more kid-friendly crafting version, you can omit the wire legs. HANG UP YOUR BOOTS ~ install a metal grommet on the back of each rain boot. Loop a piece of burlap ribbon through grommets. 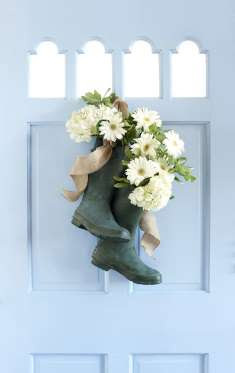 Place a 3-inch-wide cylindrical vase in both boot heels; stabilize with tissue paper if needed. Fill vase with water and seasonal blooms. (We used a mix of hydrangeas and daisies.) Tie ends of ribbon together and hang on a nail. 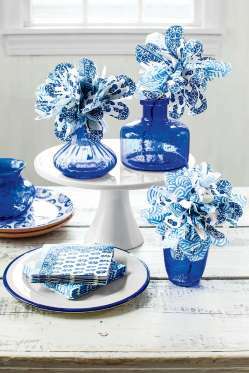 WHIMSICAL PAPER NAPKIN FLOWERS ~ fill a vase using just wire, scissors, and some patterned paper napkins. 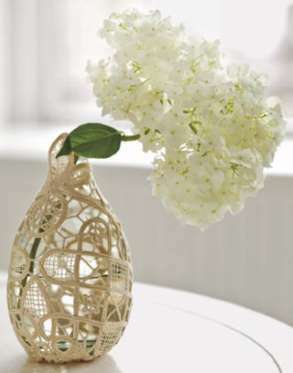 DOILY VASE ~ tightly wrap a doily around a vase. Snip away any excess, then hand-stitch the doily securely in place to create a snug fit. A clear glass vase creates an elegant illusion, but experiment with different vases and doilies to find a combination you like. 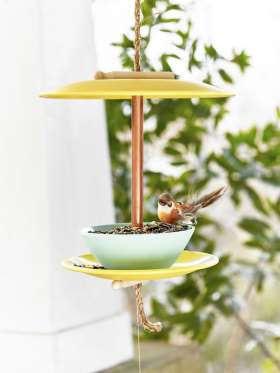 MAKE A BIRD FEEDER OUT OF DINNERWARE ~ give your birds a brand new perch by turning old dishes into a chic bird feeder. 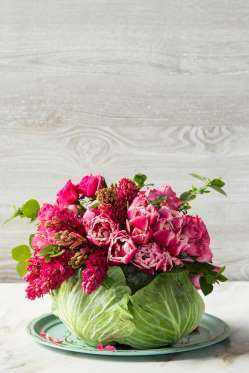 THIS COLORFUL CABBAGE CENTERPIECE ~ the perfect centerpiece for Easter, Mother’s Day or for spring parties. The cabbage is unexpected, but so easy.